Will of Aylmer Lynch, Clerk, of Langley Burrell, Wiltshire. Will dated 27 Nov 1686. Proved 5 February 1692. PROB 11/409/22 in [NA.UK]. Notes on the history of the parish of North Wraxall, W.J. Lewis, London, 1913. See review on pp.47-48 of Wiltshire notes and queries, vol.8, part 1, no.85, Mar 1914. "Divine Retribution", by William Naesmyth, pp.19-20 of July 1998 issue of Journal of Wiltshire FHS (and here). Beale memorial in the church at North Wraxall. Two stone slabs on the chancel floor. [MGH, 1910-11, p.104] says see [MGH] 2nd series, vol.3 (1881), p.396, but cannot see anything there. St. James' church in North Wraxall. to Rev. Thomas Goddard [born 1674, the new Rector] and had issue. See modern satellite view and street view of church. Beale memorial in North Wraxall as shown in [MGH, 1910-11, p.105]. 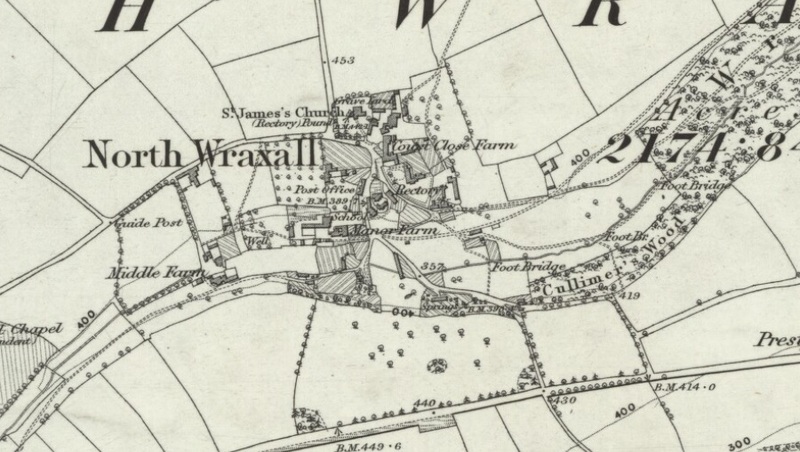 Beale memorial in North Wraxall as shown in [Lewis, 1913] according to [Naesmyth, 1998].